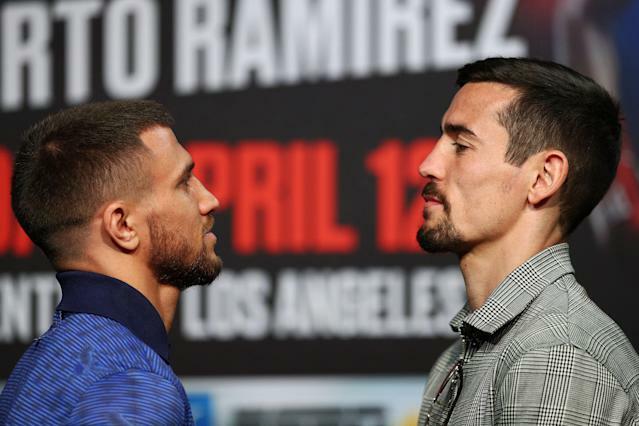 If ever there was a fight that perhaps Vasiliy Lomachenko didn’t take quite as seriously as the rest of them, it would be Friday’s bout for the WBA-WBO lightweight titles at Staples Center against Ant Crolla. Crolla is a veteran who has been in the ring with some high-level opposition, but even Crolla concedes that Lomachenko is an overwhelming favorite. Sportsbook USA has Lomachenko as a minus-8000 favorite, which translates to an expected win percentage of 98.77. “I want to shock the world and beating him would be one of the biggest upsets of all time,” said Crolla, who is 34-6-3 with 13 knockouts. Upsets happen in boxing, even to the biggest stars. Mike Tyson lost as a 42-1 favorite to Buster Douglas. Muhammad Ali lost to Leon Spinks in just Spinks’ eighth pro fight. Roberto Duran was beaten by Kirkland Laing in 1982. Laing was 2-2 in his four fights before facing Duran, and was knocked out in his first bout after beating him. These kind of upsets do happen. 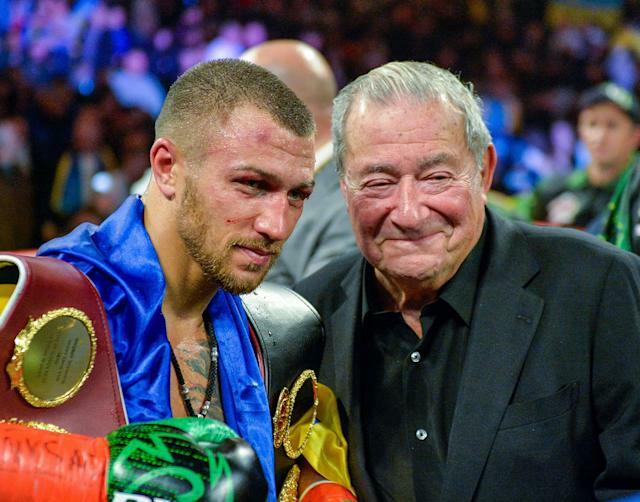 Promoter Bob Arum, who has been on both sides of such outcomes, almost gets annoyed that the bout could be a trap fight for Lomachenko and catch him looking ahead. “I have no concern — zero, absolutely none — that Loma won’t be completely prepared and focused to fight his best in this fight,” Arum said. “He is the true consummate professional. It doesn’t matter what the odds are or anything like that. I know Loma and I know boxing. Loma will look at this guy and figure him out and then look to destroy him. The fact that Crolla got the bout is something of a gift from the WBA. Crolla held that belt previously, before dropping it to Jorge Linares, the man Lomachenko stopped to win it. When Lomachenko won the WBA belt, he became a “super champion,” in its parlance and was required to defend it once every 18 months instead of once every 12 months. But when IBF champion Richard Commey was injured and couldn’t face Lomachenko, the WBA mandated the fight with Crolla. It was either fight Crolla or relinquish the belt and Lomachenko wanted nothing to do with that. So here he is in a bout he’s supposed to win in a landslide with potential matches that look increasingly lucrative ahead of him. Commey is a possibility next, though there is also the chance that Top Rank could pit Commey with its brash rising star Teofimo Lopez and have the winner face Lomachenko. And then, the dream lightweight bout that many have hoped to see against Mikey Garcia remains a possibility. Garcia, coming off a drubbing at welterweight to Errol Spence last month, hasn’t decided which weight he’ll compete at in the future. But if he returns to lightweight, Arum said it’s a bout that Top Rank would look to put together. When it was mentioned to Arum that Garcia faced a massive size disadvantage against Spence that he wouldn’t face against Lomachenko, Arum got agitated. Lomachenko isn’t the sort to look ahead, which is part of what makes him special. His only loss came in his second pro fight, when he lost a close decision to Orlando Salido, a crafty veteran who had missed weight. It was Lomachenko’s first time going 12 rounds and he didn’t know if he could do it. He has no such concern now, and he just wants to get the job done as efficiently as possible. And he’s not talking like an 80-1 favorite. It’s easy to enjoy when you’re the one doling out insane amounts of punishment while rarely being hit. He’s one of the best offensive fighters in the game, but he may be even better defensively than he is on offense. “He’s one of the few fighters who excels both ways,” Arum said. “He’s like a football player who can play offense and defense. There aren’t many of them, if any, around any more. But that’s what he does. He’s a superb defensive fighter, but unlike [Floyd] Mayweather, who was one of the best defensive fighters out there, Lomachenko brings the offense. Mayweather wasn’t looking to destroy anyone; He was looking to outclass his opponent and win by points. Lomachenko will look to do the same against Crolla, who is the fourth consecutive opponent he’s faced who has held or holds a world title. Crolla is well aware of what he’s up against and is girding for the fight of his life. “He's a unique fighter and I've had to change up sparring to spar with different guys to cover everything he can throw at me,” Crolla said. “We've used top-class sparring partners like Jazza Dickens and Frankie Gavin, who was probably the best amateur this country has ever produced. There is less pressure on me but I have my own expectations and want to give a great account of myself and cause one of the biggest upsets ever by a British fighter. But Lomachenko is mentally very tough. He makes fighters quit, I know that. I know I will have to put up with being frustrated by him. If he does, it will be talked about forever.